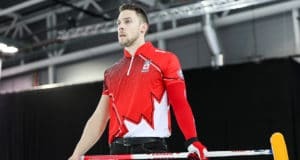 The teams traded singles in the first two ends and then Koe and Shuster played a patient game – the U.S. trying to force Canada to take one; the Canadians waiting for the Americans to make a mistake so they could get two. The break for Koe, third B.J. 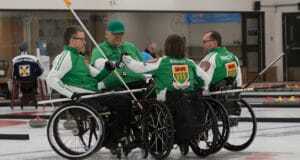 Neufeld, second Colton Flasch, lead Ben Hebert, alternate Ted Appelman, team coach John Dunn and national coach Jeff Stoughton, came in six when Shuster rolled out on two hit-and-stick shots, leaving Koe an open-house draw for the deuce. In the seventh, runback double takeouts by Neufeld and then Koe left Shuster facing three Canada stones in the house. His runback double-takeout attempt got only one, leaving Koe the steal. Shuster, third Chris Plys, second Matt Hamilton, lead John Landsteiner, alternate Korey Dropkin and coach Don Bartlett, got two of their own in the eighth and looked about to steal one in nine when Koe settled into the hack. Seconds later, his wide in-off takeout having kicked out the U.S. counter and left Canada counting two, the stands erupted. As did Koe’s teammates. “I had goosebumps for sure, that was a pretty loud roar, especially how big the game was, to get a shot like that is huge,” said Hebert, who has seen more than a few similar shots from Koe. “Me and B.J. were pretty stoked and I’m sure you saw Kevin’s reaction, he was probably out of control wasn’t he?” he said kiddingly of his always calm, cool skip. Team Canada will need more of those performances going forward with its next two games against playoff-bound Scotland and Switzerland. The win was huge, coming after losses on Wednesday to Japan and Sweden. Joel Retornaz of Italy (6-3) scored one in an extra end for a 6-5 win over Peter de Cruz of Switzerland (7-2); Sergey Glukhov of Russia (3-6) opened with a three-ender and added two in the fifth en route to a 7-4 win over Jaap van Dorp of the Netherlands (3-6); and Qiang Zou of China (2-7) beat Magnus Ramsfjell of Norway (2-7) 8-3. Japan and Sweden lead the chase for the six playoff spots with 8-1 records followed by Canada and Switzerland at 7-2 and the U.S. and Italy at 6-3.